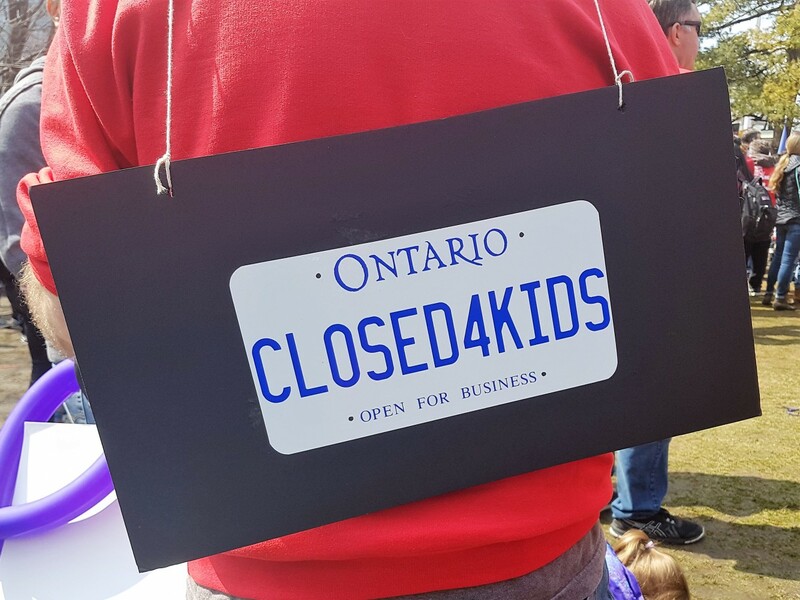 On Thursday, thousands of high school students across Brampton and the province walked out of their classes to protest cuts to their education system. On Saturday, it was their teachers’ turn to take a stand. 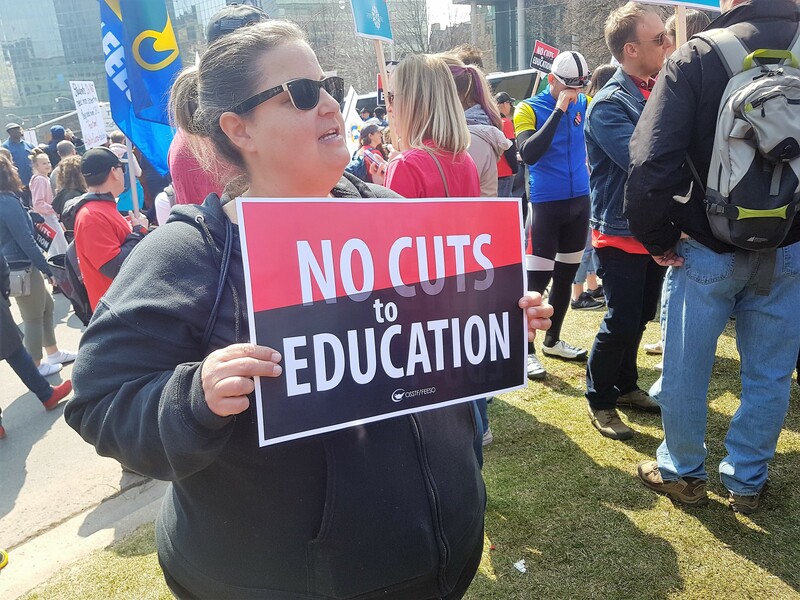 Thousands of educators from across Ontario, including many from Brampton, marched on the provincial legislature to express their displeasure over the proposed education cuts. 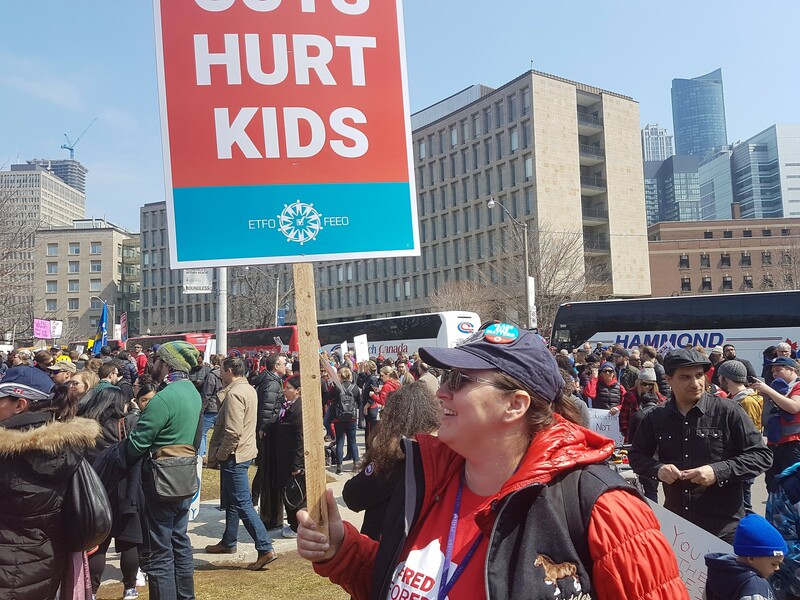 Teachers across Ontario raised red flags last month when Education Minister Lisa Thompson announced a roughly 30 percent increase for high school class sizes. On average, secondary school classes will increase from 22 to 28 students and an average of one extra student in classrooms from grades 4 to 8. “I’m concerned about that (her job) because I am a new teacher. I’ve taught internationally, I’ve taught in the United Kingdom, I’ve taught in Trinidad and Tobago...and they had small classes and it was great,” Jenine Mitrevics, a grade 12 teacher in Brampton told The Pointer. 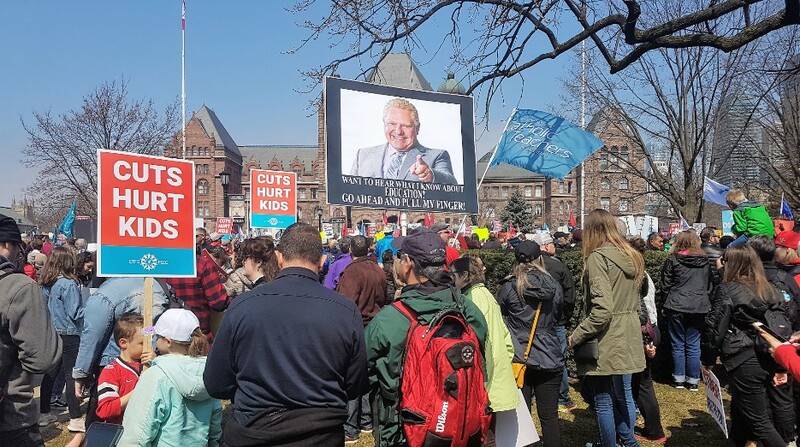 The lawn in front of the Queen's Park legislative building on a balmy spring day was packed with people, making it difficult to squeeze through from one end of the property to the other. A Woodstock-like atmosphere permeated the downtown legislative grounds as music blasted from a stage set-up near the building’s driveway and the foot traffic churned parts of the lawn into a muddy quagmire. On Friday, an education ministry memo was leaked to the Toronto Star stating that about 3,475 teaching jobs will be eliminated over the next four years. The axing of the positions will net the province about $851 million in savings. To many of the marchers, the news represented a major broken promise and created a great deal of uncertainty about their futures. Thompson and her government have said job reductions will be absorbed by retirements and voluntary leaves, with $1.6 billion being set aside to fund the attrition, allowing all teachers who wish to stay on to keep their jobs. Various unions and teachers’ groups have questioned whether this can be achieved, given the almost 30 percent reduction to class sizes. Students at Brampton’s Heart Lake Secondary School participating in Thursday’s walkout said that teachers are already so spread thin that students sometimes have to wait months to receive test scores and marked assignments. Mitrevics corroborated the claims, saying she’s already having trouble providing feedback in a timely manner. The class size averages mandated by the province are often exceeded because certain classes, including those for specialized education, have fewer than 22 students, meaning other classes can go well beyond 22. Now, with the new plan, educators say it won’t be uncommon to see as many as 35 students in one high school class, a number they say is unmanageable. 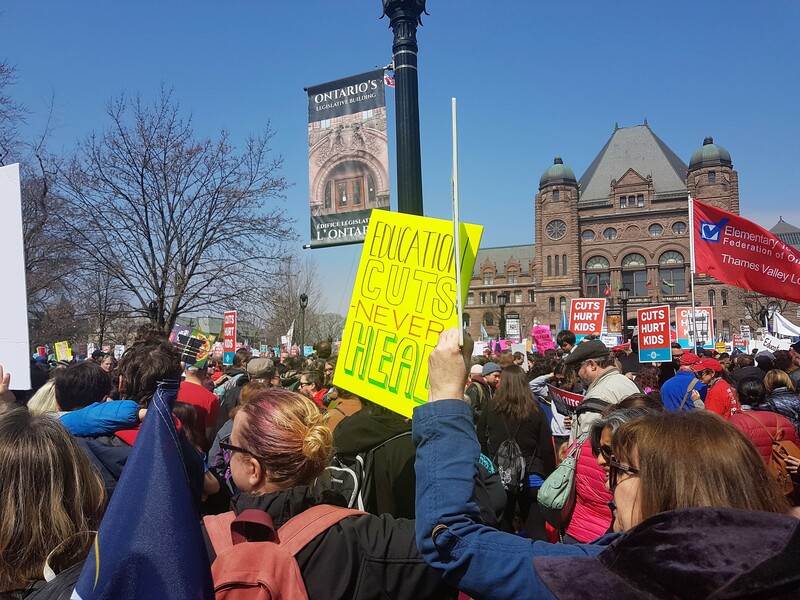 The move, teachers and experts have said, will greatly reduce educational outcomes, putting Ontario students in the public system at a distinct disadvantage. Thompson has made claims that larger class sizes creates more resiliency among students. She cited complaints from university professors regarding a prevailing lack of coping skills. “When students are currently preparing to go off to post-secondary education, we're hearing from professors and employers alike that they're lacking coping skills and they're lacking resiliency,” Thompson told the CBC’s Metro Morning. Brampton teacher Ann-Marie Naraysingh is not buying it. She says that increasing class sizes will take an emotional toll on students which would cause them to lose motivation. “If she’s (Thompson) talking about building resiliency by increasing class sizes to that extent, what’s going to end up happening is these kids are just going to give up. They’re not going to self-advocate, we see it all the time as it is,” Naraysingh, who also happens to be the sister of John Henry the mayor of Oshawa, told The Pointer. According to the Organization for Economic Cooperation and Development, an international economic development body with 36 member countries, that does not possess numbers on average Canadian class sizes, information through other sources correlating class size with outcomes is hard to come by. But OECD’s data does show that, for secondary schools, Japan, in 2016, had the highest class sizes, averaging 32 students. Chile came in a close second with 30 and Korea placed third with 28. The country with the lowest number of students per class was Latvia, with 15. In a separate 2013 study, The People’s Republic of China had the most sardine-like classrooms, with an average of 51 students nationally. It’s important to note that the studies were unclear as to how many educators, on average, were in the classroom with the students. 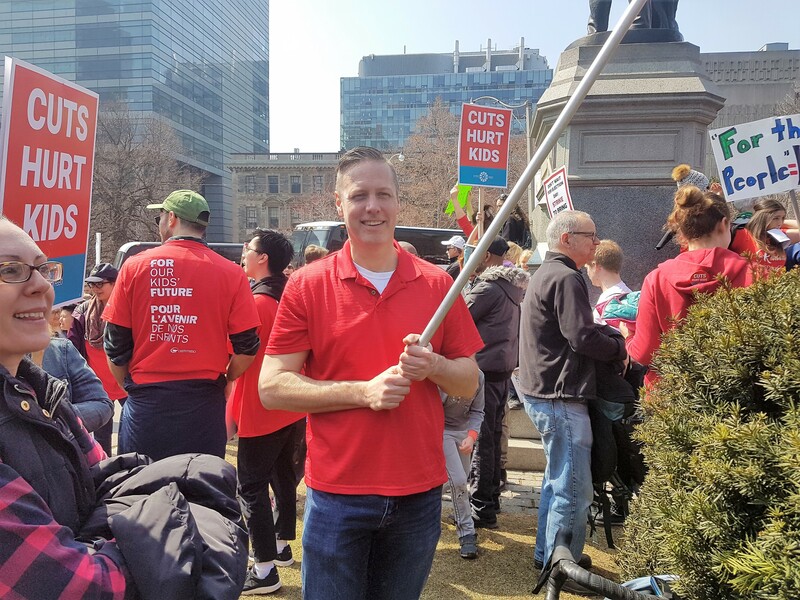 President of the Ontario Secondary School Teachers Federation Heart Lake Chapter, Dave Finlay, is a guidance counselor in Brampton and a former teacher. He has taught abroad in the Middle East and saw the difficulties larger class sizes can have. 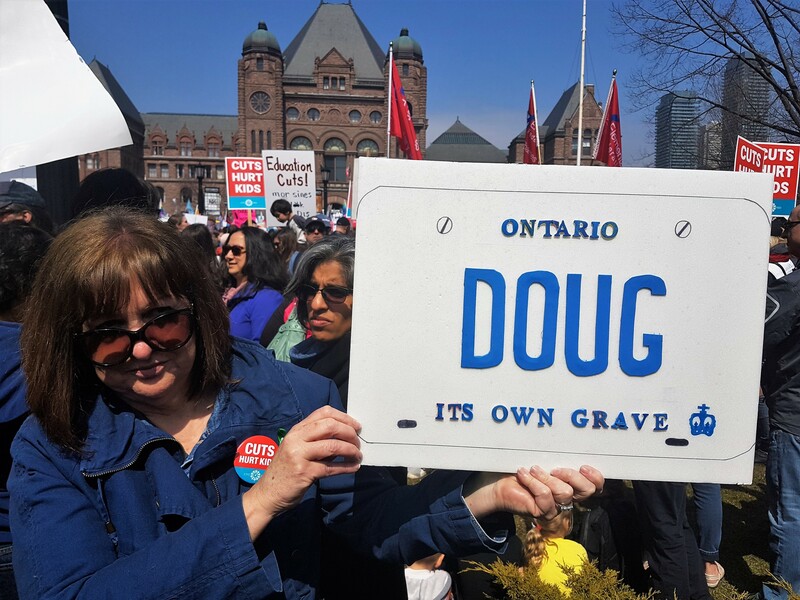 He joined thousands of others Saturday, warning that the PC government’s plan could set Ontario’s public school system far behind, after almost a decade of public investment to bring class sizes down to levels that help ensure student success. “You got to think on a per pupil basis…where we’re going to have an impact is on those smaller classes with at risk students, the kids that are really vulnerable. There is a lower ratio there to keep those kids engaged, and those are the kinds of programs that are going to get cut,” Finlay said.